Contact Dan Bush at dan@ferrarisales.com or call (801) 521-0653 for more information. Ferrari Corso Pilota Around the World, exclusively available to Ferrari customers, provides a unique opportunity to attend a condensed version of the Corso Pilota course during Ferrari Challenge race weekends. Clients participate in a perfectly structured 1-day program that provides cutting-edge scenarios for a sports driving experience. 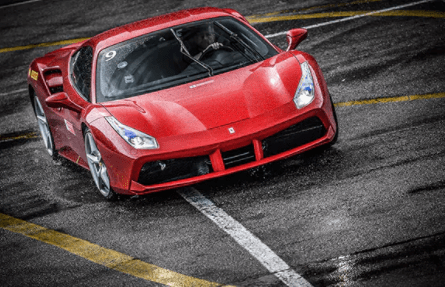 Utilizing the client’s own vehicle, this course provides a great opportunity to get familiar with the performance of your own Ferrari on track. The practical, personalized instruction by Ferrari driving instructors is aimed to give in-depth insight into driving technique and help drivers analyze their vehicle’s behavior. Up to twenty-one drivers are divided into three groups of seven participants each, and receive direct engaging instruction on the most efficient driving position in the cockpit, progressive accelerator and brake control, and establishing precise driving lines. Ferrari Corso Pilota Sport offers a complete, progressive program that is focused on providing participants with a comprehensive understanding of sport driving techniques. The Sport course consists of a 2 day training program that is based on an exclusive and personalized teaching method. It uses Ferrari cars for both track work and vehicle control exercise. The course allows for up to 21 customers, who will then be divided into three groups to receive direct and engaging instruction on: the most efficient driving position in the cockpit, progressive accelerator and brake control, establishing precise driving lines through bends and braking, and acceleration techniques. Teaching leads into thrilling car control exercises that include conditions of power over steer. The Sport course provides a great opportunity for getting familiar with the actual performance of different Ferrari model, thanks to a program that allows users to experience different electronic vehicle control setups. The practical instruction of the course is completed by several theory sessions, all aimed at giving a more in-depth insight into driving technique and helping drivers analyze vehicle behavior. Once customers have completed Corso Pilota Sport and have a firm grasp of basic driving techniques, they can progress to the Advanced Course. 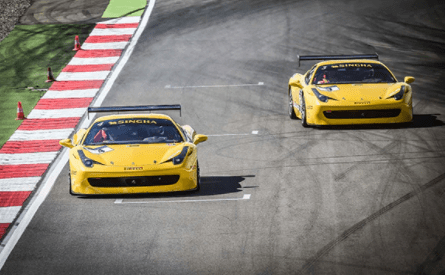 The Advance Course is reserved for 18 participants and is the natural next step in expanding Ferrari driving skills on a controlled race track environment. 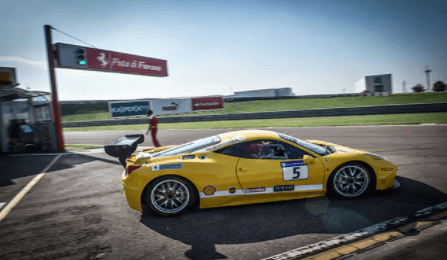 It gives participants the opportunity to do intensive, specialist Ferrari driving and learn about advanced high-speed driving and vehicle control. The emphasis, as with the other courses, is on continuity in practice and safety. This second course also involves several theory sessions that can be individually tailored to suit the technical aptitude and driving style of each person participating and continues to use the in-car data acquisition system. Starting from this Advanced course, participants learn to analyze their own performance behind the wheel through various methods including dynamic skill trials. 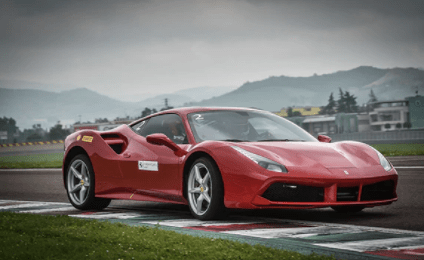 The next course is the Evolution Course, which is a 2-Day Ferrari Driving Course limited to 15 participants who have completed the Advanced Course. It provides drivers with the opportunity to develop their on-road Ferrari driving skills while experiencing the unique thrill of driving a 458 Challenge EVO race car. Users will learn driving techniques and excitement that are enhances by in-depth telemetric analysis, which is also based on the use of competition cars and tires. A highly personalized teaching approach in this course is dedicated to improving the technique and personal performance of each participant in every detail. As the name suggests, the Evolution Course is the natural “evolution” of Ferrari Corso Pilota. Through dynamic skill trials, the course helps drivers adapt sports driving techniques to day-to-day situations in advanced track sessions during which they really discover the performance of road-going Ferraris and the 458 Challenge EVO race car, plus their own personal limits. The Challenge Course is the last course in the Ferrari Corso Pilota. It is the ultimate expression of sports driving courses dedicated to Ferrari customers. The Challenge Course takes the sports driving concepts developed in the three previous levels to their natural conclusion and it is restricted to participants who have completed the Evolution Course. It is designed to offer customers an extremely professional and technically advanced instruction in order to bring customers even closer to the world of Ferrari racing. This course provides in-depth instruction that is aimed at perfecting driving technique and maintaining constant performance over timed track sessions. It also teaches participants how to take part in the Ferrari Challenge professionally, safely, and competitively. The program is based on a series of track driving sessions related to the 458 Challenge Evo and uses both chronometric and telemetric assessment to help participants gain familiarity with basic racing techniques. Some of the techniques that will be covered are: starting and overtaking, the procedures for the various stages of a race, car setup methods, and race rules/regulations. The Challenge Course really offers an exciting and professional experience for customer to become a real Ferrari racing driver.